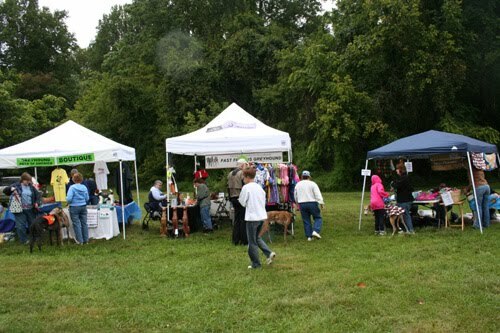 Our organization was invited to vend at the annual Greyhound Pets of America, Maryland Chapter, Saturday, September 17. Although the day was a bit on the drizzly side, the crowds were plentiful and there was a wonderful festive atmosphere! For the second year we set up our tent and sold our inventory to lots of nice people. The favorite of the day was the fleece Raven hound coat! We could have sold a LOT of those! Everyone also liked our assortment of unique greyhound figurines, vintage one-of-a-kind jewelry and, of course, our concrete garden statues! We also raffled off a vintage racing silk from the Pueblo, Colorado Race Track that is now closed. That was a popular raffle item. We are grateful for being given the opportunity to vend at this event and each year we meet and make new friends and see our old friends. We all enjoyed meeting all the beautiful hounds. We saw a few “adopt me” jackets come off the dogs as the dogs got a home! Thanks again to the greyt folks at GPA Maryland for this opporunity!! Rooooos to you all!